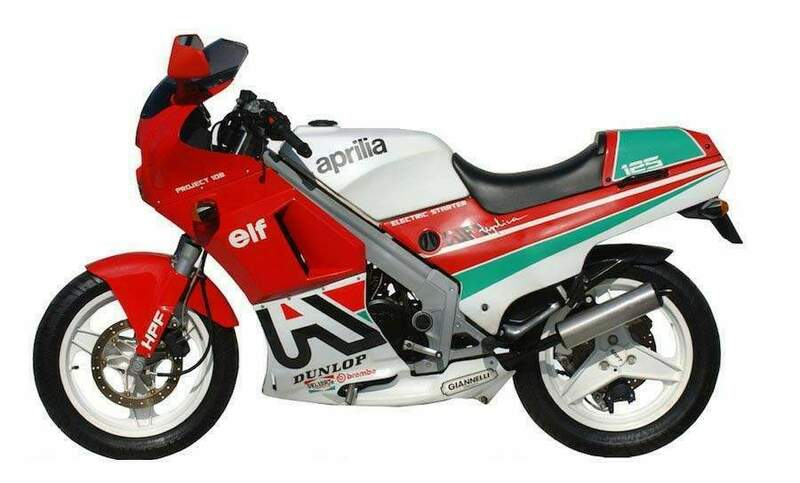 Presented at the Milan Show in 1987 and sold in December 1987 to celebrate that magical August 30, 1987 when Luca Reggiani Misano with an AF1 250 win the Grand Prix of San Marino, AF1 Replica Aprilia represents the first in the "transfer" from races to production. Interestingly, the AF1 Replica was made in bright colors not directly inspired by the racing colours. 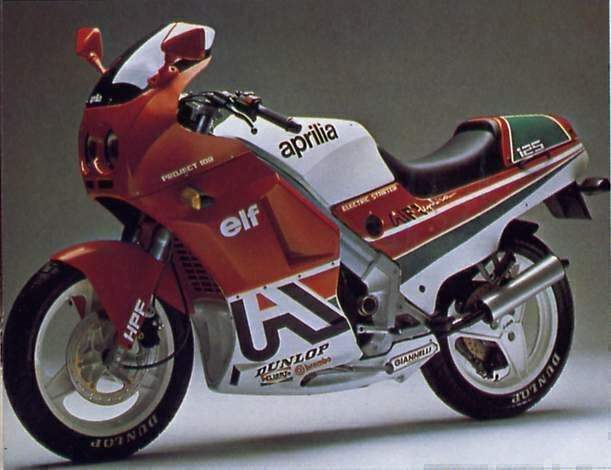 And then it is certainly possible to classify the AF1 Replica not as a model in itself, but rather as a restyled version of the 1987 model. Colors: Red / Black / White with saddle aquamarine and orange circles. The AF1 Replica, although it is characterized by a much more vibrant color than its AF1 sister, is basically the same bike, elegant, sporty and well managed. 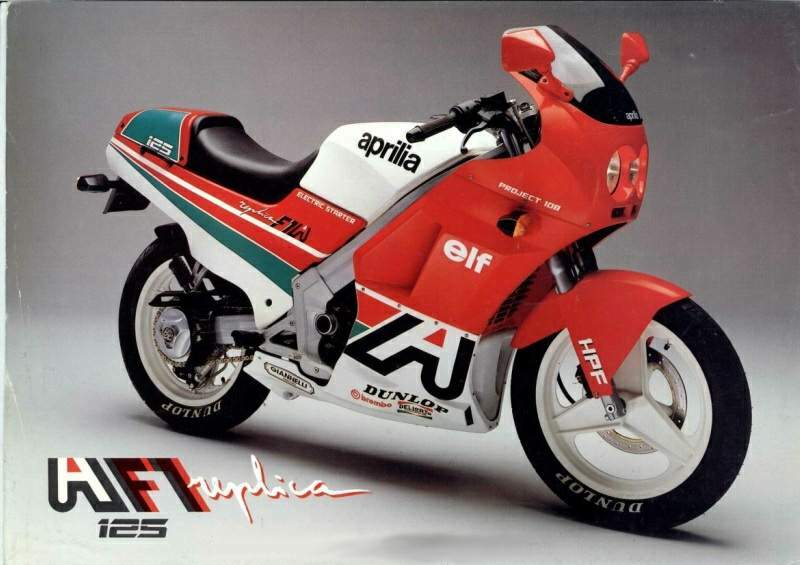 The adoption of an aggressive dual light placed in a wider windshield, a redesigned fairing and larger tail and a removable seat cover, are the differences between the Replica and the AF1. The instrumentation, electrical controls and placement of accessories (fuel tank, battery, air filter, ect ..) remains the same as AF1. The engine represents the latest evolution of the popular Rotax 127 and the Replica has slightly more thrust, although the only difference is in the positioning of transfers and the compression ratio is slightly higher (15,5:1 15,1:1 instead of the AF1). Also note the replacement of the rubber gasket RAVE valve with Viton, more resistant to temperatures and hydrocarbons. The carburetor is the same as the AF1 and the same goes for the transmission and gear ratios. The specifications now indicate a maximum power to the rear wheel of 29.24 hp at 10,250 rpm instead of 27.88 at 10000 rpm of AF1.